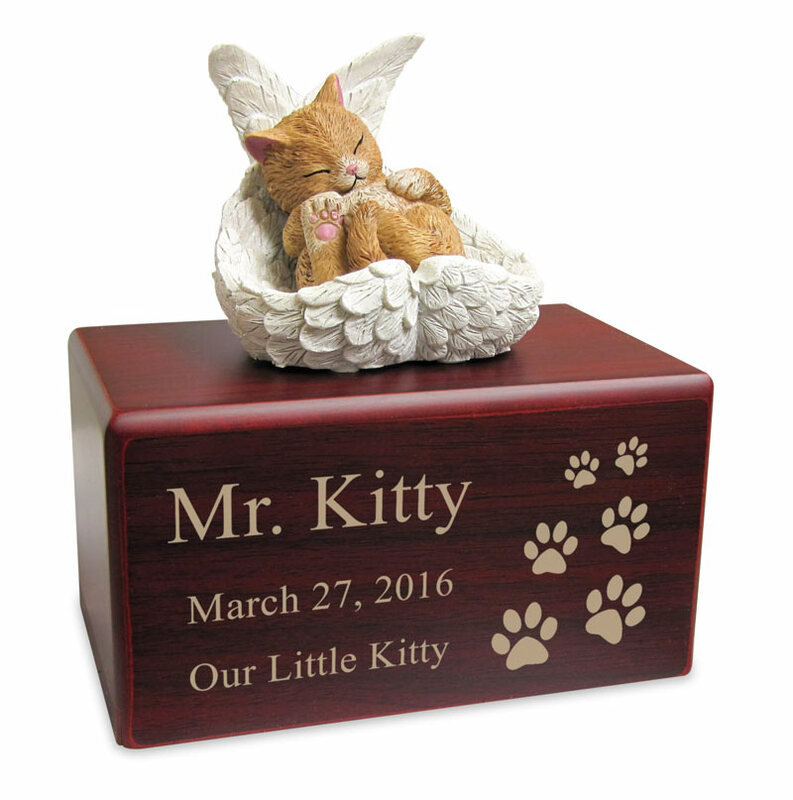 Our Hamilton Collection Tan Cat Figurine Cherry Wood MDF Cremation Urn is perfect way to honor your beloved cat. The figurine, created by artist Blake Jensen, features an adorable kitty gently cradled in a pair of angel wings. Master artisans hand-sculpt each figurine from Jensens original sketches. The heavy resin pieces are hand-painted and the wings are lightly touched with glitter. 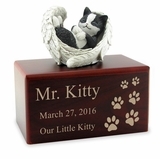 This beautiful figurine is mounted atop an MDF Wood Urn and has optional engraving. 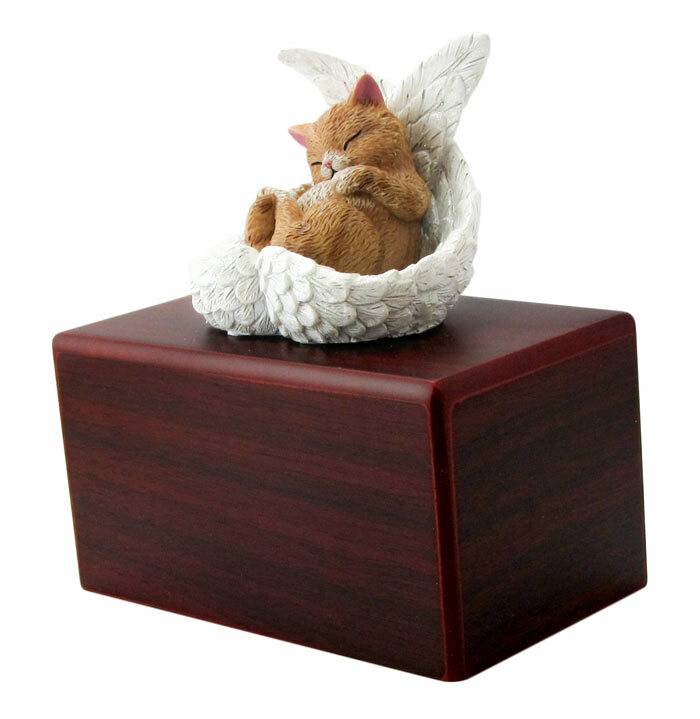 The economical MDF (Medium-density fiberboard) wood urn is an engineered wood product made by combining wood fibers with a resin binder. 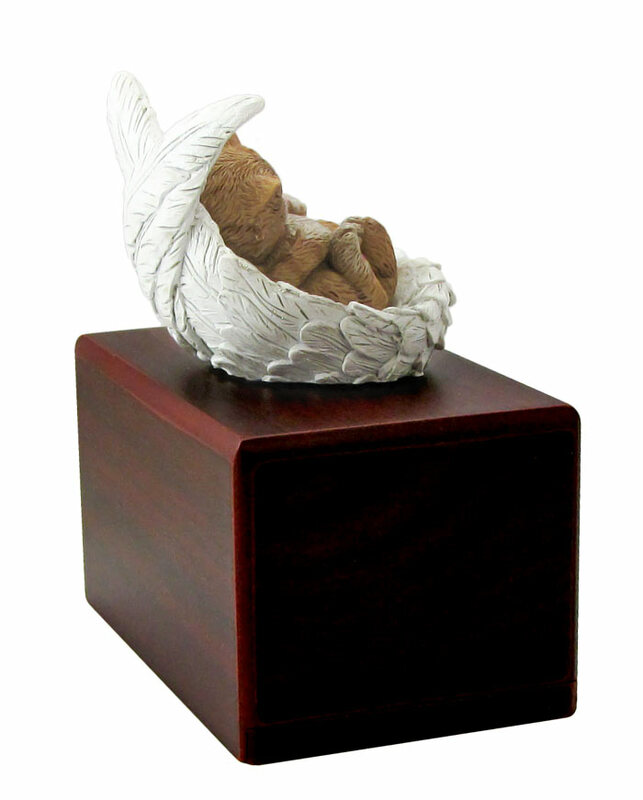 MDF cremation urns are wood veneered MDF. The veneers are real wood and are beautifully finished. Please Note: Engraving adds 1-2 business days to the shipping date of this item. Beautiful and what I wanted. The urn came in exactly like I expected it to. 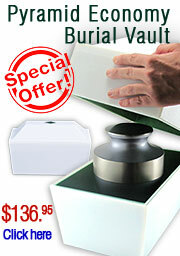 I will use Mainely Urns in the future and would recommend my family and friends to do the same. Love this urn so much! I absolutely love this urn! It is exactly what I was looking for my precious kitten! 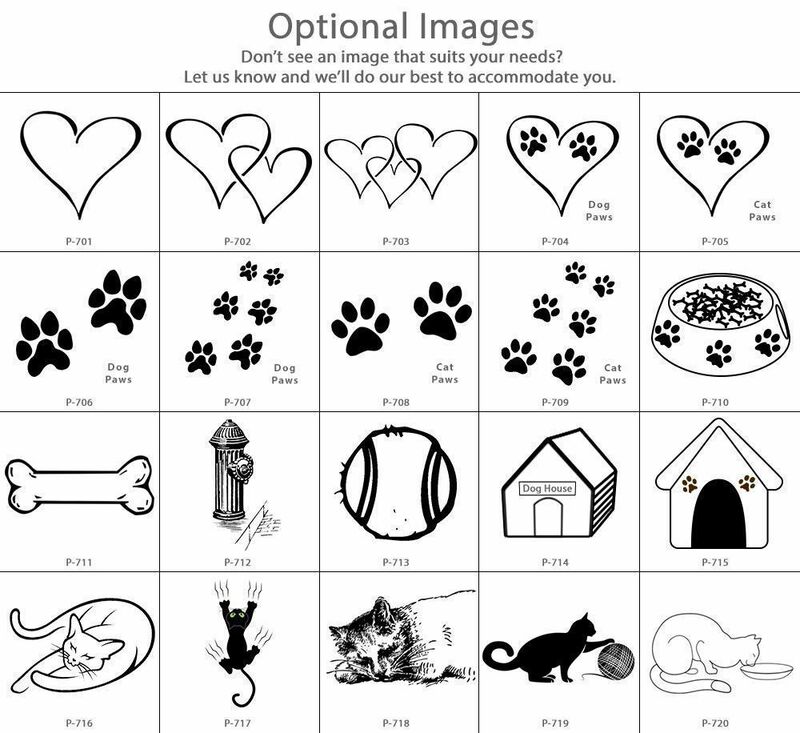 I was devastated when I lost my baby to FELV. 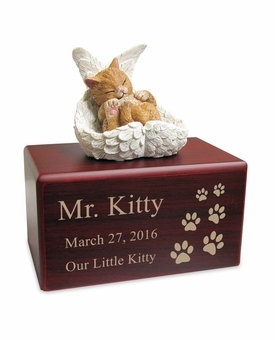 Thank you so much for having this adorable urn and for all the great customer service. Everything is purrfect and I will be recommending you to all my friends. ProsGreat product and great Customer Service. I was very happy with this Urn so I know my cat Chucky is nearby. Thank you! A Very Pretty Pet Urn! 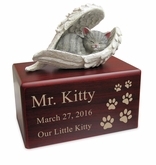 Normally I buy an urn where I can place a photo of my cat but this one caught my eye because of the angel wings. Very pretty and just right to honor my sweet girl Tinker. ConsAlthough it says 25 cubic inches with 1 pound per inch for healthy weight my girl was 10 pounds and I found the area a bit small. I had to do quite a bit of moving around of the ashes to get them to fit in completely. 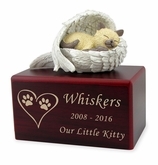 I searched and searched online for the perfect urn for our precious little calico we recently lost. I came across this beautiful Calico Cat figurine urn where the cat looks just like our precious little girl encircled in angle wings. The urn is more beautiful in person and our personalization we had put on it is perfect. Quick shipping too. Thank you so much! 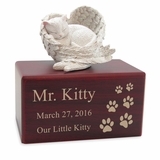 We were pleasantly surprised at the quality and design of Kitty's urn. The kitty in the angel wings is absolutely adorable. This urn is a beautiful tribute to my sweet Jake. Looks exactly like the picture and a very good size. And the company was very easy to deal with. It was shipped within the time frame stated. Very satisfied both with the product and customer service. ProsBeautiful keepsake for a faithful friend. This urn was exactly as described and came packaged well. I didn't know that when I opened the box, it would be such a perfect fit for my Lincoln. The kitty on top looks exactly like him and is great quality. Thank you. This urn is beautiful! It's the perfect tribute to my baby girl Sugaree. I had it engraved with her name and the paws and it came out perfectly. I am very pleased with my purchase, despite the fact that I had to buy it because I lost my baby. This was the perfect urn for our Arri. It is well made and attractive. Highly recommend buying from this company. Shipping was very fast, and the prices are in line with others product that are not as sturdy. Thanks Mainely Urns! 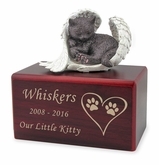 I love it, it's super sweet and a perfect memorial for one of the cutest cats ever. I got it very quickly, as well. The design is nice and the details of the engraving is on point. The figurine is beautifully hand crafted. The quality of the box could be little better on alignment of the door. Overall I love the design and it matches my love to the T.
ProsThe engraving is on point and straight. The figurine is nicely hand crafted. ConsCraftsmanship of the box is slightly off. Our order was received in a most timely manner. The company asked for our review of the inscription knowing that a mistake could have been made during our time of grief. The product was great quality & all that we expected it to be. 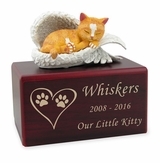 The urn is beautiful and it is perfect for my beloved cat. It looks exactly what it is shown in the picture. The quality is good and the figurine is very pretty. The cat sleeping peacefully in the cradle of the angel wings is very comforting. 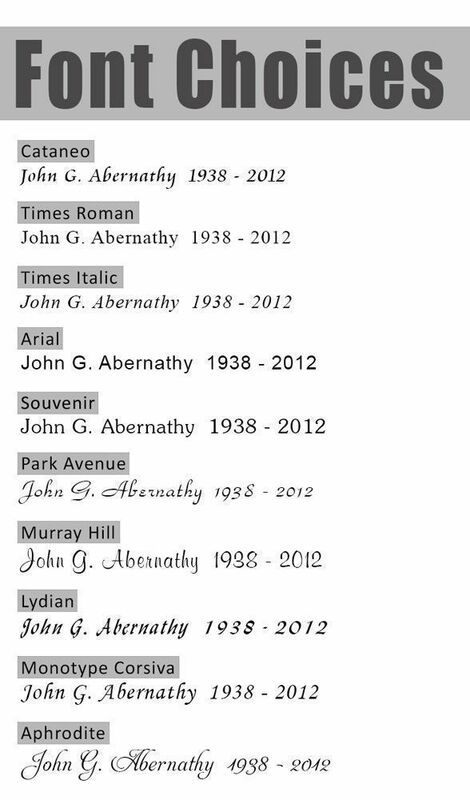 The personalized engraving is done nicely. It is exactly what I was looking for. Thank you.